What Materials Do I Need to Build Skis/Snowboards? 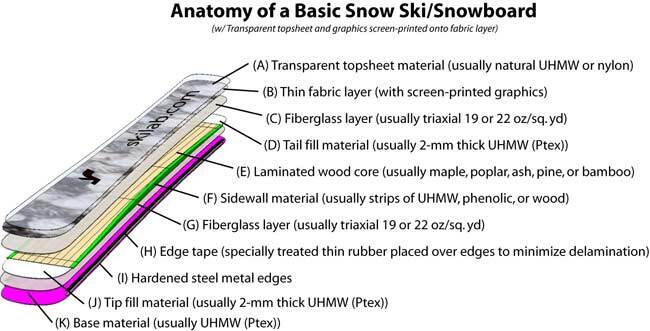 The main components of a basic DYI ski or snowboard are shown below. In this example, the graphics are screen printed or applied to a thin fabric layer, then during layup the graphic (fabric) layer is covered with a transparent topsheet material. The topsheet material helps protect the graphics layer. In some designs, the topsheet is left out and the epoxy when it cures is used to create a protective and hard coating. We provide all of the materials listed below, with the exception of the epoxy adhesive. It is recommended that you use a two-part epoxy designed for manufacturing skis/snowboards. 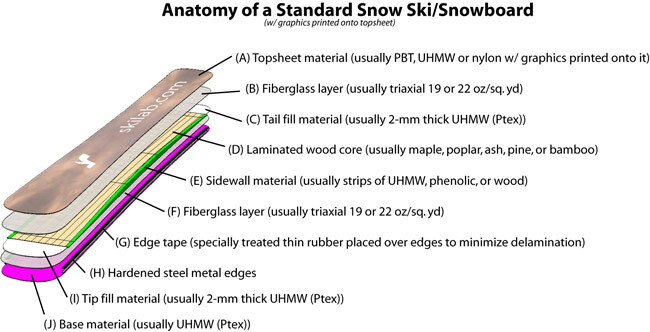 The components for a standard ski or snowboard are shown below. The major difference between the standard design shown below and the one described above is the graphics for the standard design are printed directly to a special topsheet material. For example, the dye sublimination process is typically used to print colorful graphics onto the topsheet, and the topshee with graphics is applied diretly to the top of the ski/snowboard. Topsheet material that's designed for dye sublimination printing include PBT (polyester), Galleria UHMWPE, and even standard UHMWPE topsheet. We supply all three materials. Keep in mind that the standard UHMWPE material is compatible with the dye sublimination printing process, but the PBT and Galoria material are better suited and optimized for this process.